A cold spring snowstorm had dumped 19" of new snow at Paradise on April 14-16, finally boosting the season total up over 800". Hannah and I headed up expecting a day of yo-yoing short powder runs, especially given the 5% density of the new snow and a forecast calling for "mostly cloudy with a chance of showers, snow level 3500 feet." But the Mountain had a nice surprise waiting for us. The Longmire gate opened at 10am, the road was not very icy, and we skinned up from Paradise just after 11:15 in light snow and filtered sunshine. The new snow was denser and stickier than expected, lying about 15-18" deep atop last weekend's solid crust, and the day was quite warm, feeling somewhat hot and muggy as we neared Pan Point. Fortunately, trail had already been broken the day before all the way to Camp Muir by a large RMI winter seminar party on snowshoes, followed by a similar IMG group, so we decided to simply follow the track upward and see what lay in store. Skinning up in light snowfall and sun. A few fleeting hints of blue sky gave us hope, and eventually a brief vision of the summit icecap appeared through the thinning mists. We finally burst out into full sunshine just above 7500 ft and enjoyed a magnificent day above the sea of clouds below. The Mountain in all its glory. The Muir Snowfield was very smooth, with almost no evidence of sastrugi or other undesirable wind effects. The surface was mostly windpacked powder, with areas of proto-corn forming already above 9000 ft in the thin new snow atop the old crust as we neared Camp Muir around 2:45pm. Winds were quite light on the Snowfield, with only a comfortable breeze, and temps were near freezing or even slightly above. 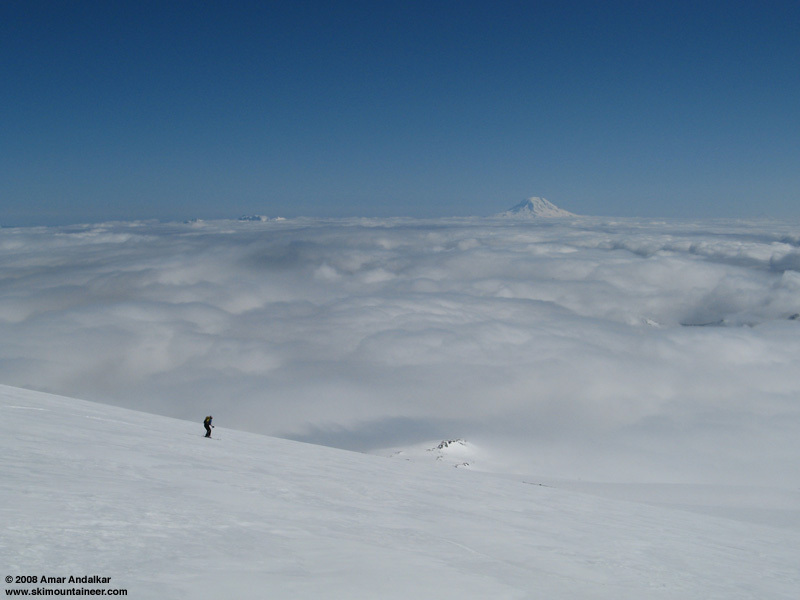 The Goat Rocks (left) and Mount Adams (center) rise above the sea of clouds. 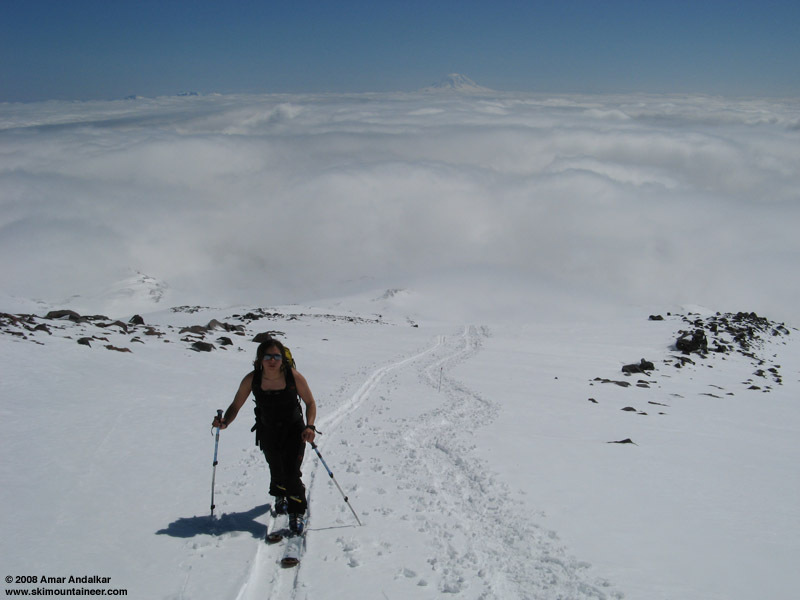 During a lengthy break at Camp Muir we debated our ski options, considering the Cowlitz Glacier or Paradise Glacier as alternatives to the same-old Snowfield. 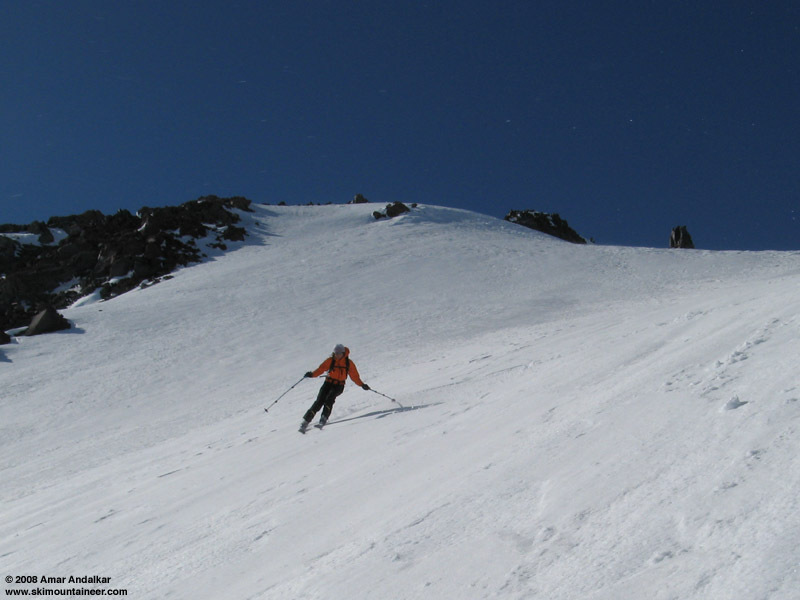 We finally opted to head up the Cowlitz Cleaver a bit to ski the steepish gully dropping down from 10360 ft (perhaps informally known as "Triple-A Gully"). Unfortunately, the wind was howling along this stretch, with 30-40 mph gusts tugging at the skis now on our packs, and flinging spindrift and small ice pellets horizontally at us. High winds and blowing snow on Cowlitz Cleaver. We huddled behind some rocks, clicked into our skis, and skied down just after 4pm. The 35-40 degree slope of the south-facing gully held nicely softened spring snow, several inches deep atop a firm base. Hannah carving turns down the gully, with windblown ice pellets flying across above. Admiring our tracks in the gully. Below the gully, the flatter Snowfield was mostly smooth, fast windpacked powder. We cruised down in big sweeping arcs, back into the sea of clouds. The snow below Pan Point was very heavy, semi-consolidated, and rapidly turning to concrete. A not-too-taxing slog through the concrete brought us back to the car before 5pm. Despite the cool grey overcast, we both basked in the glow of the unexpected sunny surprise we had enjoyed far above. Next stop: Mount Hood (see other TR). Cruising down the Muir Snowfield above the sea of clouds.